Day 25, book 25. 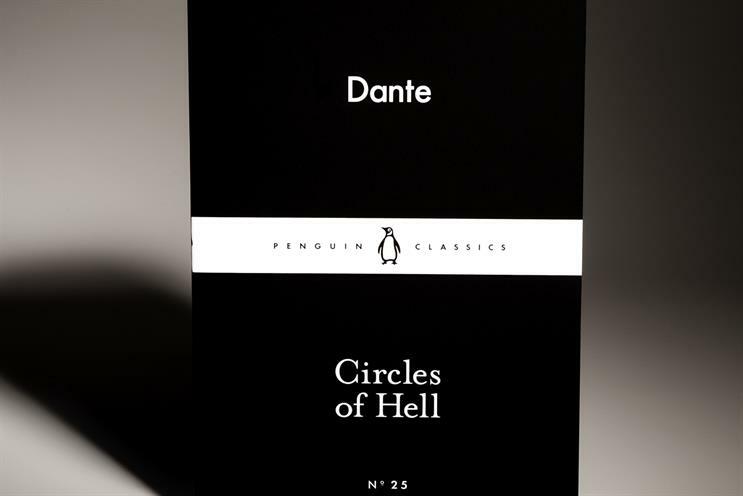 Dante's masterpiece contains, among many other things, the most compelling account ever written of the horror of mediocrity. I cannot think of a book that has landed on so apt a day. It is Tuesday of Cannes week, and I am journeying through Dante’s Circles of Hell, with nothing to guide me but the distant glint of superyachts, wondering which particular echelon of the underworld, which particular expression of eternal anguish might have been reserved for us Riviera Pilgrims. The sun beats down, and the mind boggles. I see plagiarists, molested by serpents in the desert of their barren minds, like the Thieves of Canto 24. I see gold-diggers, suspended by sockless ankles, writhing inverted above catacombs of cash, the soles of their loafers aflame with Sambuca, like the Simonists of Canto 19. I see playboys borne aloft and buffeted by the Mistral’s chaffing air, gusted like starlings from the Carlton Terrace and set to drift forever on a sultry wind, like the Lustful of Canto 5. I see career climbers, buried in the same blocks of ice of that chill their wine and stifle their loyalty, stacked in columns like meat in a warehouse, the Traitors to Benefactors of Canto 34. And, of course, I see bon viveurs, "squashed flat by battering rain" and condemned to rain-lashed Winter on the Croisette, waiting to be devoured by Cerberus (or a passing Alsatian) – the Gluttonous of Canto 6. I am released from this reverie by a man on the terrace next to me whose pressing first world problem, spoken loudly into a Bluetooth earpiece, is whether the taxi barricade has encircled the private runway at Nice, or whether they will need to be ‘copter-lifted, "like in Saigon". I feel the circles of Hell pressing in on me, as ill-mannered guests with leathery cleavages impose themselves on the maître d’. I start to imagine punishments of my own. The sea turns pink with Ott-stained urine as pedalo-goers, captive in their craft, circle the bay for eternity. Lining the red carpet of the Palais are giant selfie sticks bearing the Villebrequins of the damned, their owners condemned to skinny dip in perpetuity in the scalding water of a malfunctioning rooftop Jacuzzi. But nothing of my own delirious making is as troubling as the third canto, and everyone in Cannes should read it. It describes a place just inside the Gates of Hell where the air is filled with the "plaintive wailing" of the mediocre – those "whose lives, contemptibly, / Were void alike of honour and ill-fame." The anguish and ignominy of this half way house, where deeds are neither good enough to grace the beauty of Heaven nor bad enough to reach the depths of Hell, has a powerful corollary in the secular world of advertising, governed as it is by a loathing of all things meh. For its abundant infernality, Cannes inspires us to think further than this first circle. It is one of the few places on earth where average is a public abomination, and we are right to brave its Sulphurous air.